Gas burners my hiss or sputter or cease to work at all. 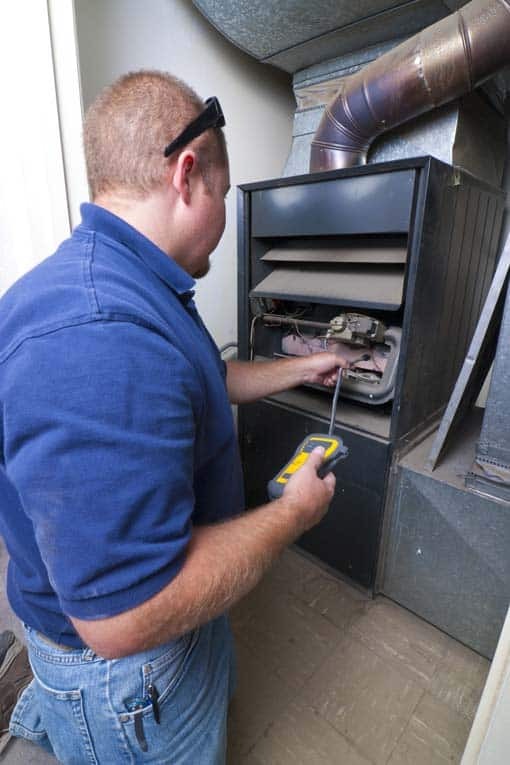 Here is some helpful information on how to repair and maintain gas burners. Healthy gas burner flame is blue. 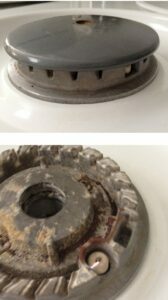 Wait to perform your repair until the stovetop surface is cool. Make sure all controls are turned off. Take the grates off the surface of the stove, and then lift up the cooktop. Use the metal rod found inside to prop the cooktop open. Locate the faulty burner’s air shutter. This is often near the front of the appliance. Unscrew the shutter’s setscrew, until it is loose but not off. Turn the burner on high. If a noisy flame is your problem, slightly close the shutter until the flame burns quietly. If a yellow flame is your issue, open the shutter until the flame burns blue. Retighten the shutter’s setscrew, close up the cooktop, and replace the grates. When you lift the cover off of this gas burner, you can see the gas ports and the electronic ignition spark (don’t touch the spark!). Most problems with gas ranges have to do with the flame—either it isn’t quite right or it’s nonexistent. Many new gas ranges have “electronic ignition,” a spark igniter that starts the flame as gas flows through the burners. If, when you turn on one burner, it fails to spark but you hear sparking at other burners, food or cleaners may have clogged the burner ports. 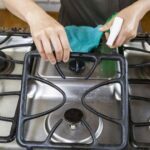 Be sure the burner is cool, then remove it and wash it thoroughly. Insert a toothpick in the orifices around its perimeter to remove any debris or clogs. If this doesn’t do the job, the igniter or the burner switch may need replacement by an appliance repair person. If none of the burners work, be sure the pilot light is lit if your cooktop has one. 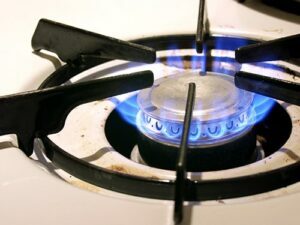 Be aware that gas cooktops rely on electrical power for their ignition systems. Be sure the unit is plugged into its receptacle. 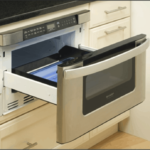 You’ll typically find the receptacle behind a freestanding range or at the back of the cabinet below a built-in cooktop. Also make sure that the circuit breaker serving the appliance is in the “On” position or that its fuse has not blown. 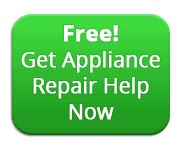 Check both the main electrical panel and any secondary subpanels that supply power to the appliance. If necessary, reset the circuit breaker or replace the fuse. If the circuit blows again, there is probably a short in the electrical system. Call an electrician.